I’m on vacation this week, so I was looking for a quick and easy post. Searching for ideas, I discovered this poem three folders deep in my archives. It dates from the mid-1980s. The author was a friend of a colleague, and was looking for an outlet for her poetry. I promised I’d get it into print, then promptly forgot about it. Her poem languished on 7-8 generations of hard drives, starting with a 20 Mb (!) HD on an 8 MHz IBM AT — my first personal computer. My operating system was DOS, my monitor was a 12″ monochrome CRT, and my rich-text editor was New York Edit, purchased for $5 on a floppy disc. The internet did not exist. So it’s about time these words saw daylight. 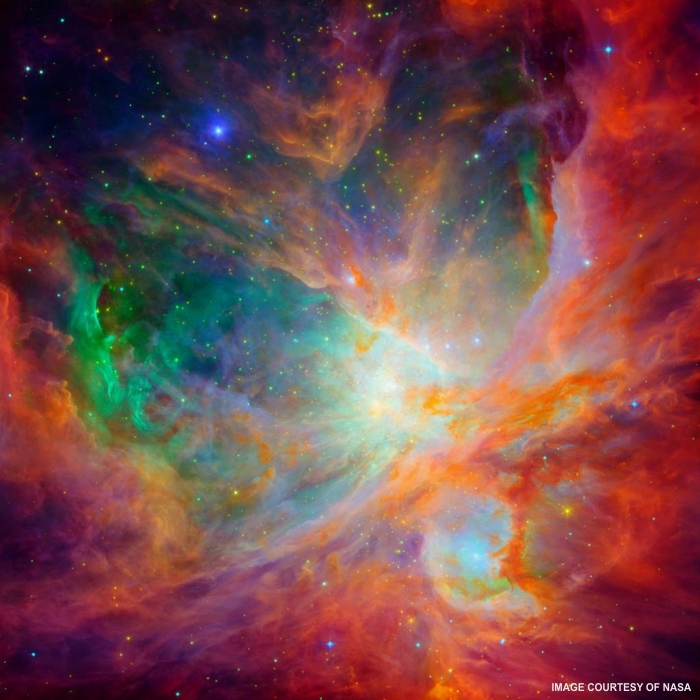 Of course, I needed an appropriate graphic to go with it, and the Hubble Space Telescope provided an excellent image of the Orion Nebula, colorized to enhance contrast. Enjoy. My slumbering soul awakened to nature’s color kaleidoscope. A profusion of crimson and a hint of burnished orange. Ablaze with the pulsating prism of life’s colors. And the Phoenix offered purification to me. And resplendently lit my homeward path. Coaxing me to life’s renaissance. To the zenith of celestial wonders.